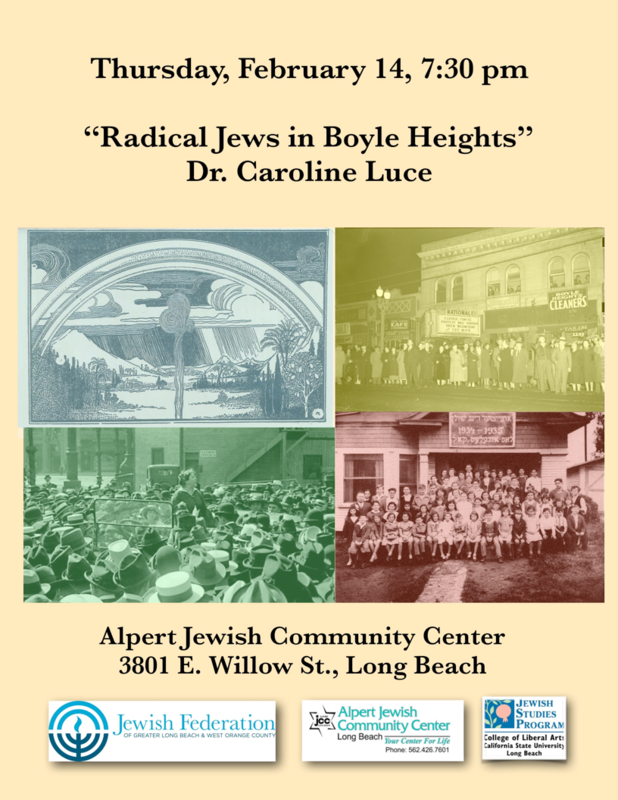 The CSULB Jewish Studies Program is very excited to welcome Dr. Caroline Luce to Long Beach. She will speak on “Radical Jews in Boyle Heights” on Thursday, February 14th, at 7:30 pm, at the Alpert JCC (3801 E. Willow St.). In the 1920s and ‘30s, one third of all the Jews in Los Angeles lived east of downtown in the working-class neighborhood of Boyle Heights. Unlike much of Los Angeles, Boyle Heights was a multiethnic, multiracial community (a 1939 housing report described the neighborhood as “hopelessly heterogeneous with diverse and subversive racial elements on almost every single block”). That diversity included not only Jews, but Mexicans, Japanese, Armenians, Italians, Russians, and African Americans. For government officials, the subversive nature of Boyle Heights was not limited to being racially integrated, but also for its politics. Labor organizers, socialists, communists, and anarchists all called the neighborhood their home. 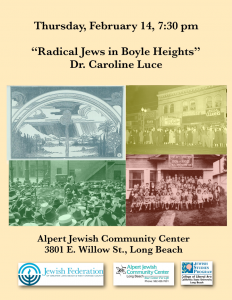 In her talk, Dr. Luce will examine this forgotten radical history, one that shaped the Los Angeles Jewish community and continues in various forms to today. Dr. Luce is the Research and Digital Projects Manager of the UCLA Alan D. Leve Center for Jewish Studies and the Chief Digital Curator of the Mapping Jewish Los Angeles Project, and she has also curated several major exhibitions for the Mapping Jewish Los Angeles Project, including The White Plague in the City of Angels, Hugo Ballin’s Los Angeles, and Recovering Yiddish Culture in Los Angeles.